The view was beautiful, the parking was really useful and besides few problems the apartment was nice. Property was absolutely amazing. I loved it to such an extent that if i have the opportunity and money i will consider buying it. Apt was equipped with all what was required. View from apt was stunning. There were chairs to sit outside while it was raining. I loved it absolutely. We like everything. Thirty capsules coffee is our over expectation from other resort we ever experienced, meaning this host is very generous and welcoming. The house is quite good. Just like in your home. The nearest train station is not too far, and the bus stop is just 1 or 2 mins to arrive. You can go to Gosausee and Hallstatt from here. The host was there when we arrived and gave us the key to check-in. The rooms were big and spacious, the bathroom was clean and spacious as well. 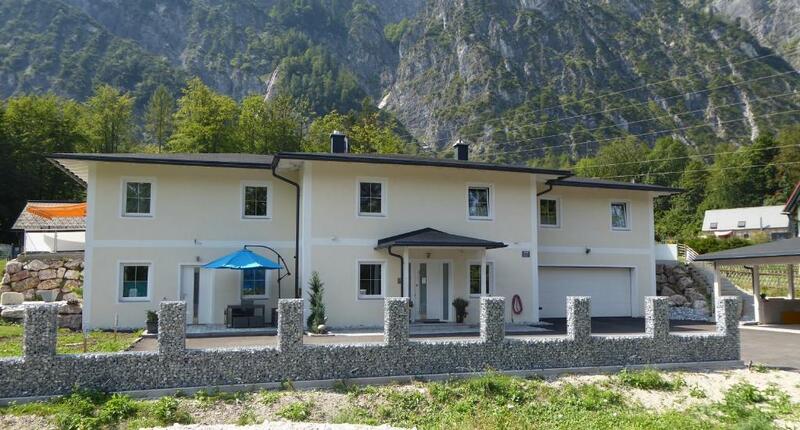 The location is very good, as it is close to Hallstatt. Location is perfect. Partial View of the lake and river on one side, mountains and a waterfall on the other side where a big living room and bedroom accessible terrace is. Hallstatt is only about 6km away and the bicycle/walking trail around the Hallstatter lake is only 100m from the location. Space is big and clean. Comfort bed and nice shower space after a long day. Location is 10 mins to Hallstatt. 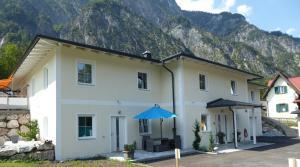 Location is very convenient, bus stop and very good restaurant were really close it was easy to get to Hallstatt. The apartment is nice and new. Good facilities and space is much bigger than expect. Lock in a great price for Ferienwohnung Seeklause – rated 9.3 by recent guests! 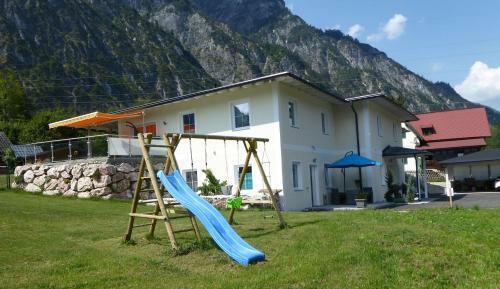 With mountain views, Ferienwohnung Seeklause is located in Bad Goisern and has free WiFi. Each of the units features a kitchen and a living room with dining area and a flat-screen TV. A dishwasher and coffee machine are also offered. Materialseilbahn is 5 miles from Ferienwohnung Seeklause. W. A. Mozart Airport is 49 miles from the property. When would you like to stay at Ferienwohnung Seeklause? This apartment has a dining area, seating area and oven. In der Umgebung können Sie verschiedenen Freizeitaktivitäten wie Skifahren und Wandern nachgehen. Die nächste Therme in Bad Ischl ist ca. 10 km entfernt. Den Flughafen Salzburg erreichen Sie nach 51 km. House Rules Ferienwohnung Seeklause takes special requests – add in the next step! Please inform Ferienwohnung Seeklause of your expected arrival time in advance. You can use the Special Requests box when booking, or contact the property directly using the contact details in your confirmation. The minor thing is availability of restaurants and bars nearby, nothing to do without the car. Nevertheless, the location is perfect. Pizzeria Romana (5 minutes riding) is open until 23:00, nearby “Steegwirt” serves food until 21:00 and drinks until 22:00 (great selection of beer and wine). The apartment with terrace is perfect. Spotless clean and tidy - it isn’t a regular accommodation out of the city. The owner is keeping it in a great condition, and entire house was renovated, so everything is new, even bathroom. Welcome amenities are available: coffee (decaffeinato and regular) and Nespresso coffee machine with milk. Views from the windows are amazing. The owner Mr Houdek does not speak English well, but his wife does. The apartment is equipped by essentials you may need - towels, bath towels, liquid soap and soap, toilet paper. Dishwasher with tablets. Great WiFi signal is available even outside on terrace. I am not sure about ironing facilities, which was not available in the apartment, but maybe provides upon request. Washing machine is unavailable, at least in the apartment. Comfortable bedding - despite it was not a king size but a double bed. Bed frame makes sounds, but not a big deal. Well arranged sofa-bed, which definitely fits 2 persons. Parking spots are free of charge at the house - perfect. I would recommend to prepare some food for the breakfast in advance, or to go directly to Halsstatt to have it. As a nearby hotel offers the breakfast for their guests primarily and may admit your request. The host was kind enough to offer later check-in, as you never know arrival time while ridding longer than 5 hours. I would definitely recommend this place and once travels bring me and my wife back stay here again. It was very cold mostly during the night with no possibility to increase the temperature. Very early in the morning (around 6) there is no hot water in the shower. During our 6 nights stay, the towels were not changed, no one cleaned the apartment (and I think we paid for that), no one took the garbage out and no new toilet paper was brought. Location is not so convenient. Just to raise awareness, there are many ticks in the area. Check your exposed surfaces after spending time outdoors. My little sister had a tick bite on her abdomen after eating breakfast out on the patio. Nothing to do with the property but important for visitors to know. The apartment is very new (there is still packaging film on the shower door) and everything is very updated! There is plenty of cookingware in the kitchen and both the living room and the dining area are very cozy and easy to gather around. The view is absolutely gorgeous and the patio area definitely provides a lovely way to soak it all in. The bedroom is very comfortable and there is plenty of storage space if you need it. The hosts speak predominantly German but are very nice and accommodating. There are also reserved parking spots for guests. The apartment is in a very quiet area that seems to be still up-and-coming but it's 15 minutes to Hallstatt and trailheads literally in the backyard. We have a very nice stay. Great private space with friendly and accommodating hosts on site. The bed in the main bedroom could be better. Address didnt lead to property. Phone and data line is bad in the unit itself probably cz its abit outskirt and underground. Wifi connected but couldn't use at all, so basically I have 3 days 2 nights without any internet at all.